This is a step-by-step guide to creating compliance apps using the Docker version of the GovReady-Q Compliance Server. GovReady-Q compliance apps are generally developed in an off-line development environment, usually on the app developer’s macOS or Linux workstation — any environment that can run Docker. In this environment, the compliance app data files will be stored in a local directory. This guide assumes the use of a local workstation for development and discusses production deployment at the end. If you haven’t already done so install Docker on the workstation and, if appropriate, grant non-root users access to run Docker containers (or else use sudo when invoking Docker below). Next download GovReady’s docker_container_run.sh script. This script simplifies passing various settings to create and configure the govready-q docker container that we will use for local development. Note that pwd is used to ensure the paths are absolute. The script will download the govready/govready-q image from the Docker Hub, which could take a few minutes. 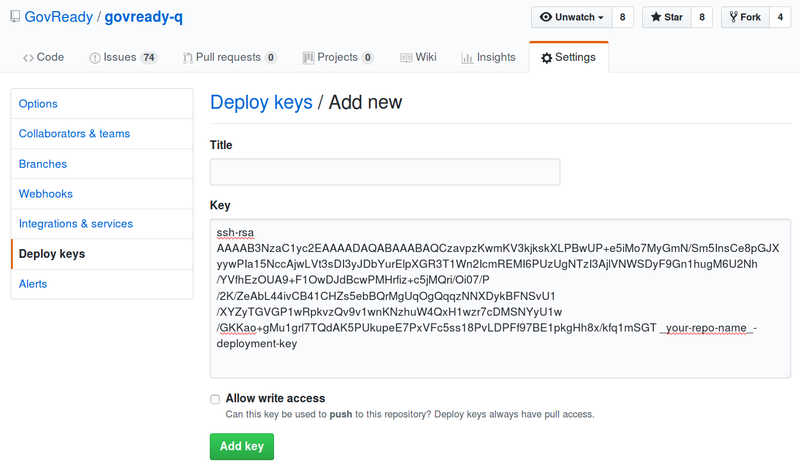 It will then start a new Docker container named govready-q and will launch the Q source code within it. Let's create your first Q user. This user will have superuser privileges in the Q administrative interface. Let's create your Q organization. 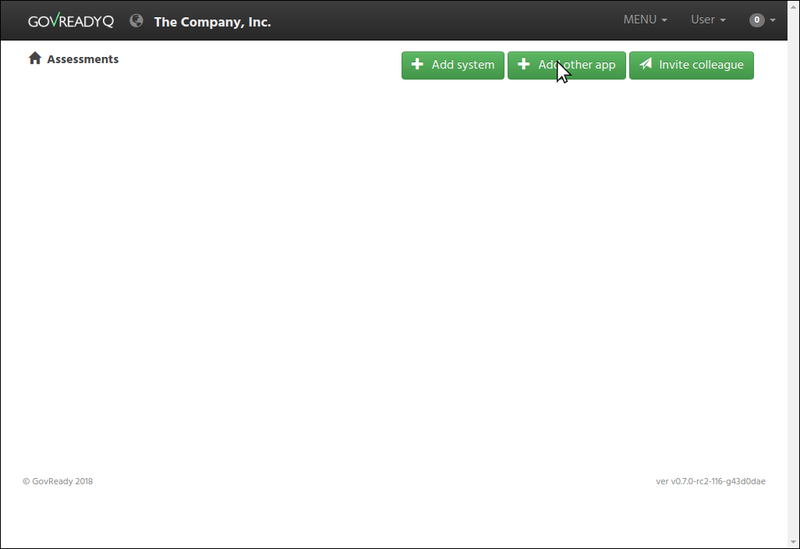 Organization Name: The Company, Inc.
You can now sign in with the administrative username and password you created. Congratulations! 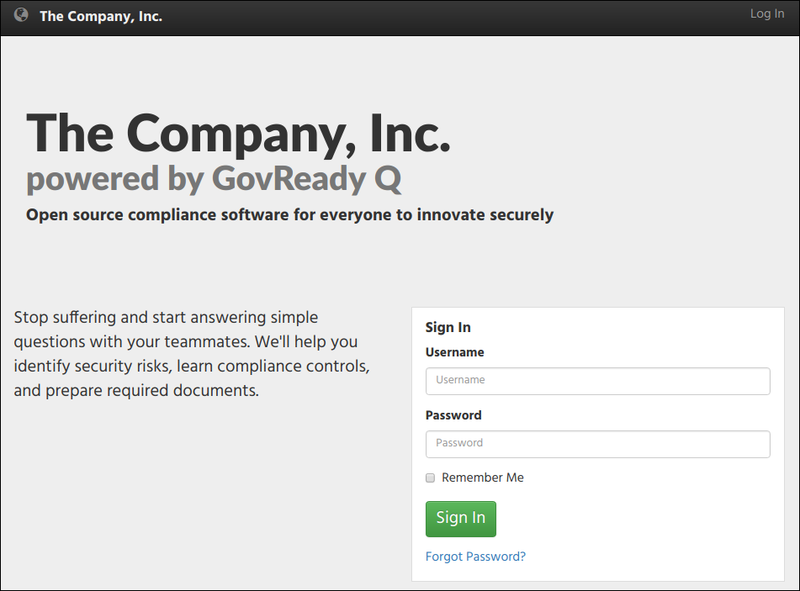 You’ve installed GovReady-Q Compliance Server configured for local development of compliance apps! 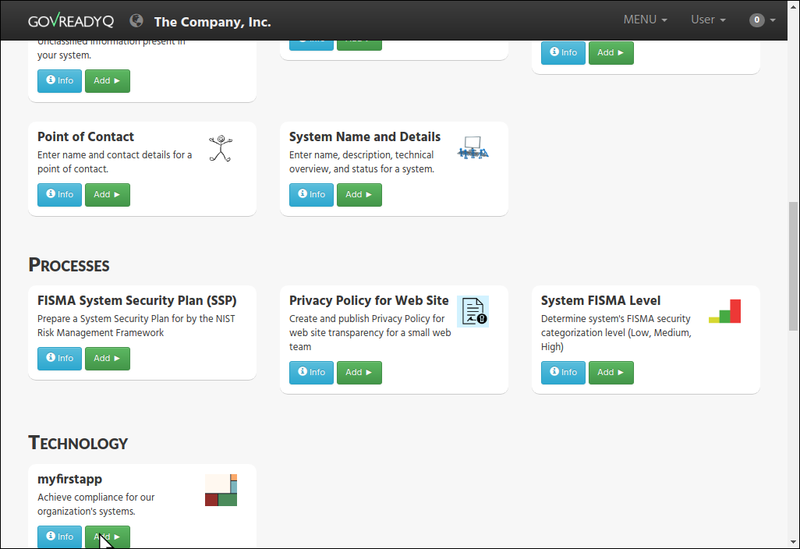 In this section we’ll create our first compliance app. The app will appear in the compliance apps catalog in GovReady-Q. Click Add other app in your browser to go to the compliance apps catalog. 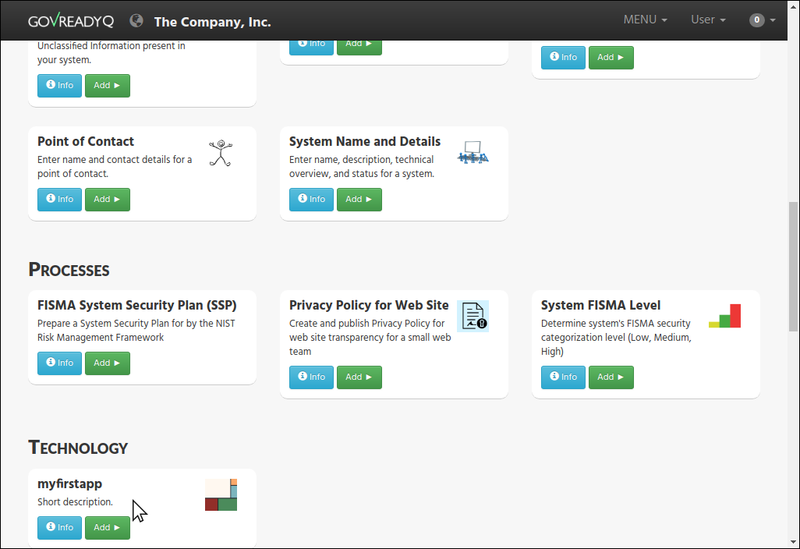 Head back to your browser and reload the compliance apps catalog page. Achieve compliance for our organization's systems. Since this file was created by Docker, which is running as root, the file will be owned by root. You may need to use sudo to edit this file. And then reload the catalog page in your browser to see your description beneath myfirstapp. You can also edit the app’s title and other catalog metadata, including the app’s icon in apps/myfirstapp/assets/app.png. In your browser, click on the myfirstapp entry’s Add button in the app catalog. We can edit our new compliance app by editing its app.yaml and example.yaml files on disk in our favorite text editor (described in this section) or with GovReady-Q’s built-in authoring tools (described in the next section). 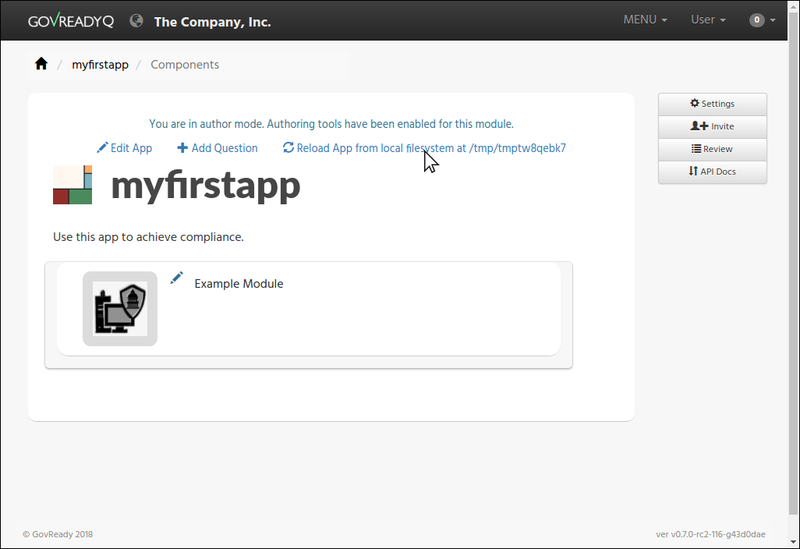 After each edit to the compliance apps files on disk, it may be necessary to restart the Docker container if you modified app catalog metadata (as you did above with docker container restart) or start a new instance of the compliance app from the compliance apps catalog page in your browser, if you modified the app’s questions and output templates. GovReady-Q purposely does not automatically recognize changes to compliance apps on disk until a new instance of the app is selected or a reload command (described below) is issued. This ensures previously loaded versions of the compliance app correctly maintain data entered by end-users. 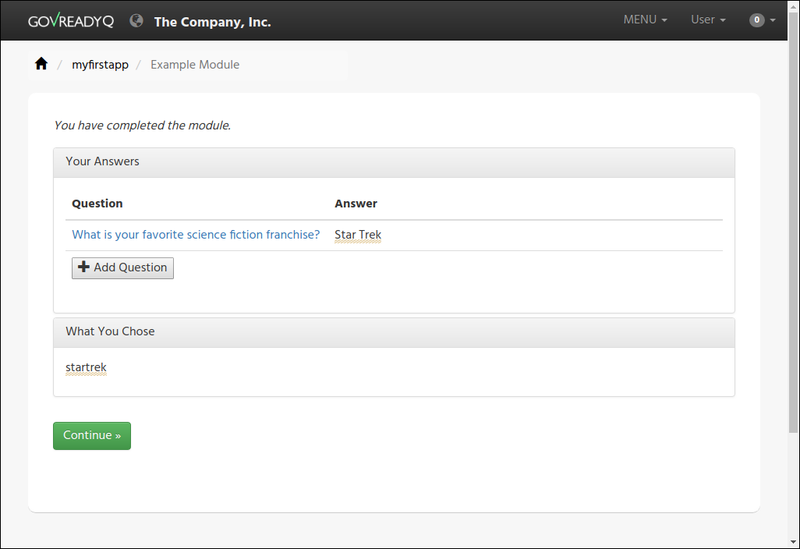 The new app has a single question labeled by the title Example Module, as you see in the YAML and in your browser. When the user clicks Example Module in the browser, they will start a new module defined by the YAML file referenced in the module-id data, in this case example.yaml. As described above, reloading the page in the browser will not show the change. This is by design. Since you are developing an app on your local filesystem, the GovReady-Q authoring tools are available. 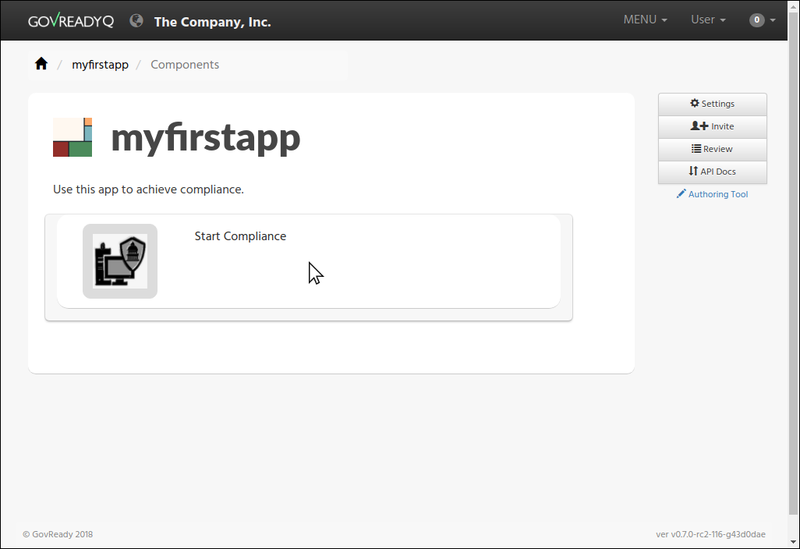 Note how Start Compliance now appears in the browser. title: What is your favorite science fiction franchise? prompt: What is your favorite science fiction franchise? Change the prompt or choices. As described above, reloading the page in the browser will not show the change. This is by design. Go back to the main app page, click Authoring Tool and then Reload App from local filesystem, and then go back to the Start Compliance page. Your changes are now seen in your browser. More information about the file format of modules can be found in Modules, Questions, and Documents. It is also possible to edit a compliance app’s questions without leaving your browser. When editing the compliance app via GovReady-Q’s built-in authoring tools, you will immediately see the changes in the instance of the compliance app you are editing without having to reload it. The changes are also immediately written to the files on disk. 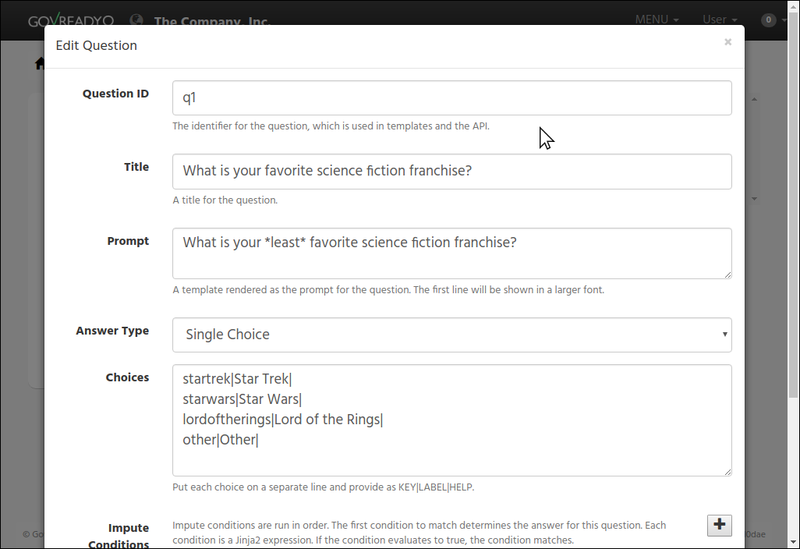 GovReady-Q’s built-in authoring tools will let you edit and add questions, but currently won’t let you change the name of the description of the app in catalog. You will still need to edit those details in the compliance app YAML files stored on disk, as described above. This is a much easier way of editing questions! Try editing this question. After clicking Save Changes, look in your text editor to see that the changes have been immediately saved to example.yaml. It is also possible to add questions. In order to add a question, all of the existing questions must be answered. 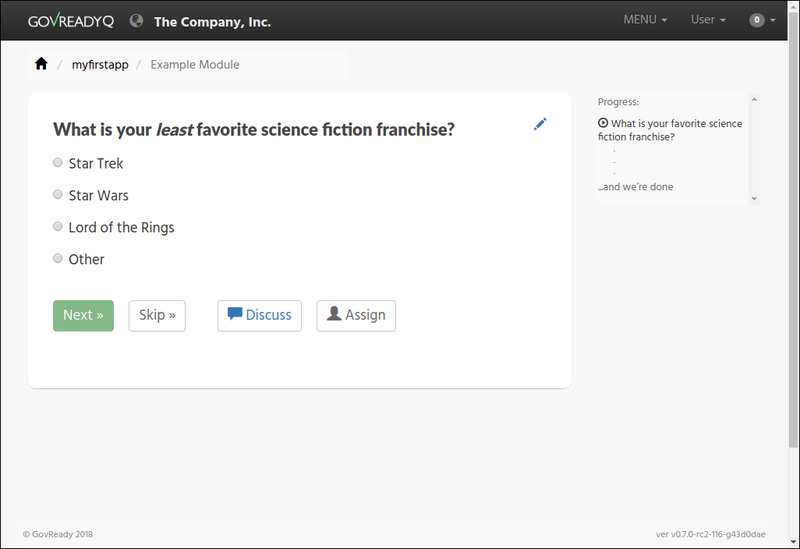 Answer the sample question, or click Skip. Try out the Add Question button now. It will create a new text question. Use the blue pencil icon to change the question’s prompt and choices. You have now seen how to create and edit an app! Your workstation’s instance of GovReady-Q has been configured to load apps from the local filesystem. Your organization’s production instance of GovReady-Q can be configured similarly, but more likely it will be configured to load apps from a remote git repository. If you have an existing source code control system containing apps in this layout, consider checking out the repository locally so that it is in the same path provided to the --appsdevdir argument to docker_container_run.sh. If your repository is in a different layout or if you are using multiple repositories to store compliance apps, see below. On the production GovReady-Q instance, log into the Django admin at https://production-q/admin. Add a new App Source. Set its Slug to a short name for the repository, composed of letters, numbers, and underscores, such as mygitrepo. As with local development, the production system’s compliance app catalog may be cached. 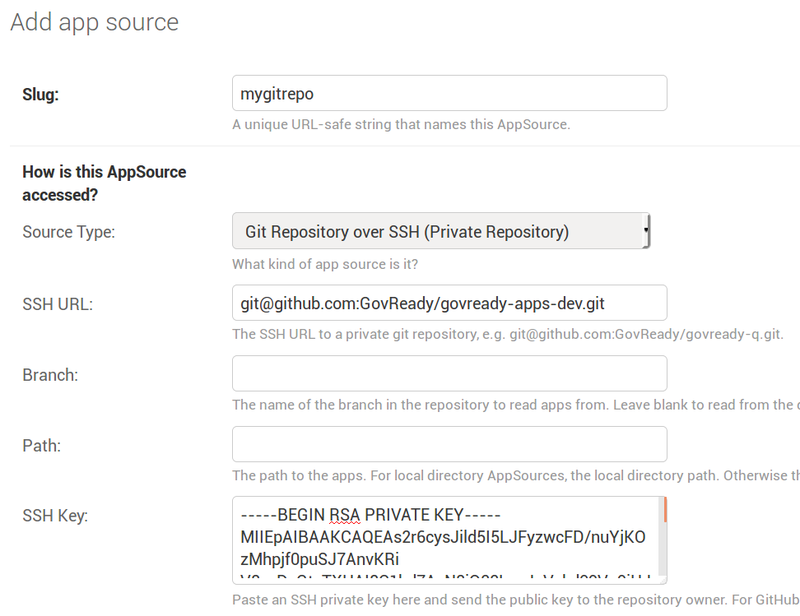 To see new apps, restart the production instance of GovReady-Q. 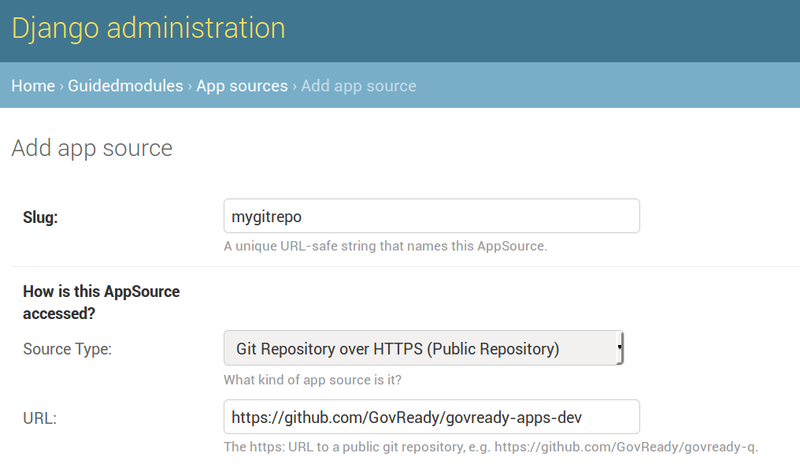 See App Sources for more information about how to configure your production instance of GovReady-Q to load apps from local filesystem directories, git repositories (including on-prem git repositories), or GitHub. In this guide we have used the --appsdevdir command to specify a location in which app YAML files and assets are stored. In a small setup, all apps could be stored in a subdirectory of the location given to --appsdevdir. But you may want to separate apps into different folders, such as if they are divided between folders in a single git repository or across multiple git repositories, then a more advanced configuration of GovReady-Q is necessary. For the first, set the Slug to repo1 (or any other label that will help you distinguish the two repositories), the Source Type to Local Directory, and the Path to /mnt/apps/repo1/compliance_apps. For the second, set the Slug to repo2, the Source Type to Local Directory, and the Path to /mnt/apps/repo2/compliance_apps. 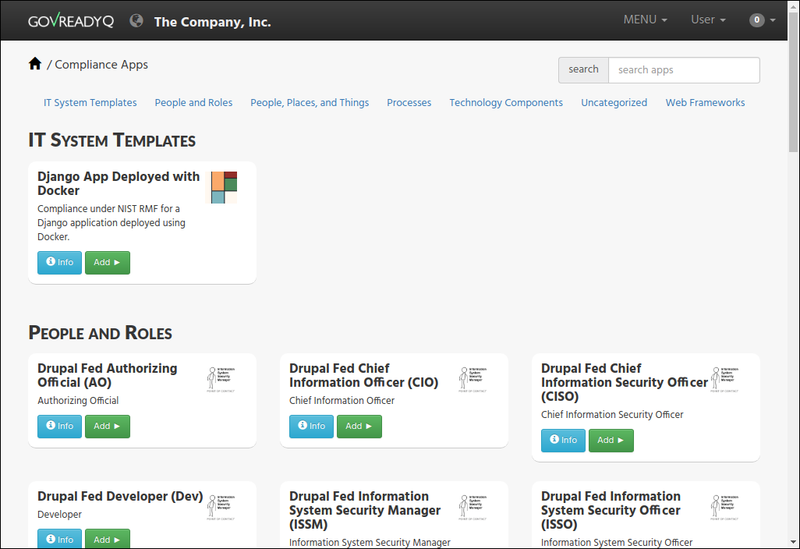 and the apps defined in all of the repositories should be visible in the compliance app catalog.